This week's election was one of the most widely anticipated midterms in years. While control of Congress changed hands, we're more concerned about what the election meant for investors. 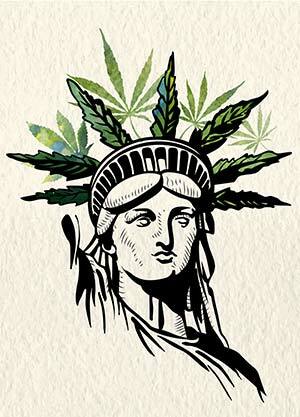 And the midterm elections showed us the mainstream potential of cannabis investing. Three of four states with some form of cannabis legalization on the ballot approved it. Michigan, Utah, and Missouri all voted for more access to cannabis, including full legalization in Michigan, even though North Dakota voted against it. This was the latest chapter in the unstoppable "green wave" sweeping the country, and even the world, to legalize cannabis. For example, Michigan became the 10th state, plus the District of Columbia, to legalize recreational marijuana. And the initiative got 56% of the vote. Utah's and Missouri's proposals limited it to medical use, but they are continuing the trend toward more access to cannabis. Now 33 states allow medical marijuana. Shortly after Canada legalized marijuana for all uses last month, it actually ran low on supplies. Demand was overwhelming. The culprit limiting supply was cannabis' own success as the infrastructure needed to deliver it was not mature. This the growth of this fast-moving trend should have investors' mouths watering. You're looking at the chance to get in early on an explosive new industry, one that's still in its infancy but has the chance to become a giant. While three states voted to expand access to cannabis, there's even more to the story. Money Morning Defense and Tech Specialist Michael Robinson, who has been following the cannabis wave for years, pointed out that there were no less than 36 major cannabis reforms on the ballots in six states. They range from reducing penalties to outright decriminalization. And even counties are getting in on the wave as they voted for legalization of medical, if not recreational marijuana. We're excited to see cannabis legalization gaining ground this election season, but the outcome created another massive catalyst. Now that the election is over, U.S. President Donald Trump asked for the resignation of Attorney General Jeff Sessions. Sessions was notoriously against marijuana legalization and used his powerful law enforcement position to harass the industry. It's no wonder cannabis stocks shot higher immediately after the news broke. With Sessions gone, President Trump's next attorney general could be much more cannabis-friendly. President Trump already said this year that he supports ending the federal prohibition against marijuana. Make no mistake, this election is going to be a major catalyst for cannabis stocks. It happened after each prior legalization event too. Whether it was legal drug approval to fight the symptoms of epilepsy or opioid addiction, or state-wide initiatives in places such as Colorado and California, stocks rallied on the news. Revenue in the cannabis industry has quadrupled from 2014, hitting $10.82 billion in this country. It employs 200,000 Americans, and that trend is rising, too. And all of this happened under the cloud of federal prohibition, which still makes the possession and use of marijuana illegal. Cannabis companies are cut off from the banking system. They cannot deduct certain expenses from the taxes. And many U.S.-based money managers cannot or will not buy U.S. cannabis companies at this time. These restrictions are on the way out as legalization gains steam, which means there's little time to wait to still get in early.